This elegant Renaissance villa was built in Trastevere at the beginning of the 16th century for a wealthy Tuscan banker who also happened to be the papal treasurer for Pope Julius II. Its U-shaped plan and central loggia facing the formal garden differ from the more stately rectangular palazzi which dominated urban architecture at the time, and the design is attributed to Baldassarre Peruzzi, a pupil of Bramante, and Giuliano da Sangallo. The most important artwork is the original fresco decoration of the villa itself, notably the ground floor frescoes by Raphael depicting the myths of Cupid and Psyche in the loggia and “The Triumph of Galatea”, similar to Botticelli's famed “Birth of Venus”. Other important decorative and trompe-l'œil frescoes by the artists Sebastiano del Piombo, Giulio Romano, and Il Sodoma can be viewed on the upper floors. This imposing 15th-century palace is located just around the corner from Piazza Navona and houses the National Roman Museum, a collection of Greek and Roman sculptures that in the 16th and 17th centuries belonged to the German Cardinal Markus Sitticus, who purchased the palazzo in 1568, the Ludovisi-Boncompagni family, who sold their 100-plus pieces of ancient sculpture to the Italian state in 1900, and a few other aristocratic families who ceded their collections over the past century. 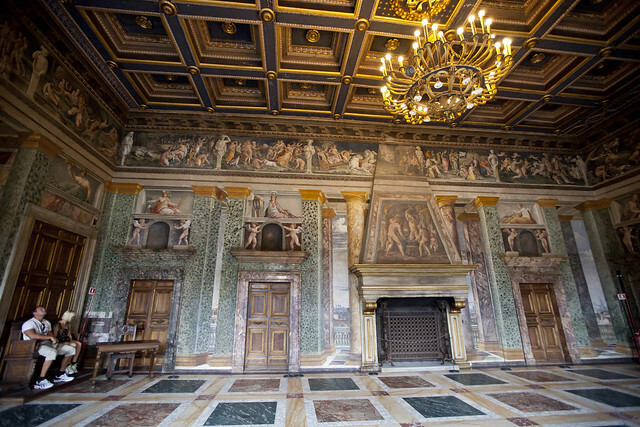 The palazzo halls are decorated with breathtaking Renaissance frescoes, most importantly in the Sala della Piattaia, the loggia, and the Room of the Painted Perspectives. The original wooden ceilings dating from the 1600's are still visible on the lower floor, and many rooms display a number of fragmental layers of decorative frescoes dating from successive schools of art that were uncovered in later restorations. One of the most impressive palazzo museums in Rome is the work of two great Renaissance architects: Carlo Maderno, who transformed the original 16th century Villa Sforza into a more formal and stately palazzo with an innovative design including a semi-enclosed garden; and Bernini, who succeeded Maderno after the latter's death in 1629 and brought his unique aesthetic as a sculptor to the final design, which he completed in 1633. Palazzo Barberini became influential in architecture throughout Europe, especially details like the use of a central two-story hall backed by an oval *salone,* and symmetrical side wings that extended forward to create a semi-enclosed courtyard. 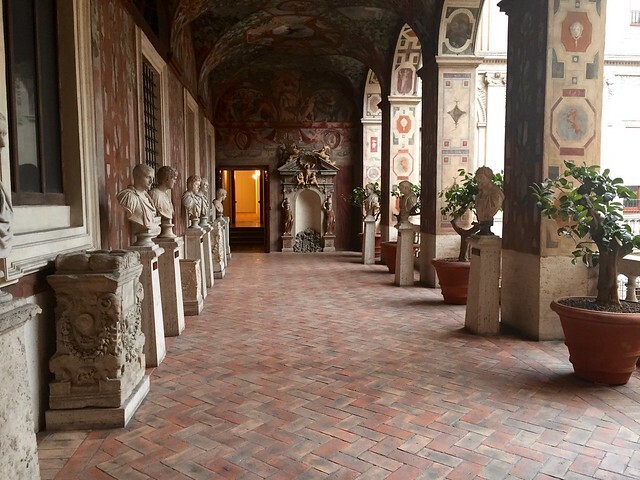 Aside from other design details like Borromini's helicoidal staircase and a number of important frescoes, the palazzo is home to the Galleria Nazionale d'Arte Antica, one of the most important collections of paintings in Italy. Works include “La Fornarina” by Raphael, “Judith Beheading Holofernes” by Caravaggio, and a Holbein portrait of Henry VIII. 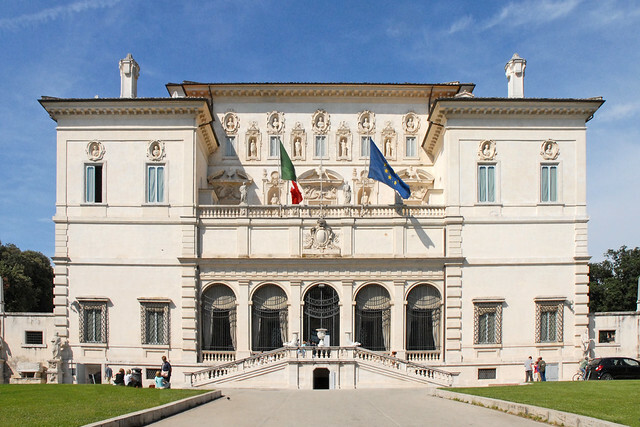 This delightful villa located in the Villa Borghese park is now home to the Galleria Borghese, one of Rome's most beloved small collections. Though now located in the center of the city, the informal villa, originally used for leisure, was on the outskirts of Rome when built in the 17th century by the architect Flaminio Ponzio based on sketches by Scipione Borghese himself, and was sold to the state at the beginning of the 20th century. The collection is one of the most sumptuous in Rome, based on the tastes of Scipione Borghese who was an avid collector of sculpture by Bernini and paintings by Caravaggio, among others. Important works include Caravaggio's “Boy with a Basket of Fruit”, “St Jerome Writing”, and “Sick Bacchus”, Titian's “Sacred and Profane Love”, and Raphael's “Entombment of Christ”, alongside a number of Bernini's breathtaking pieces of Baroque sculpture. 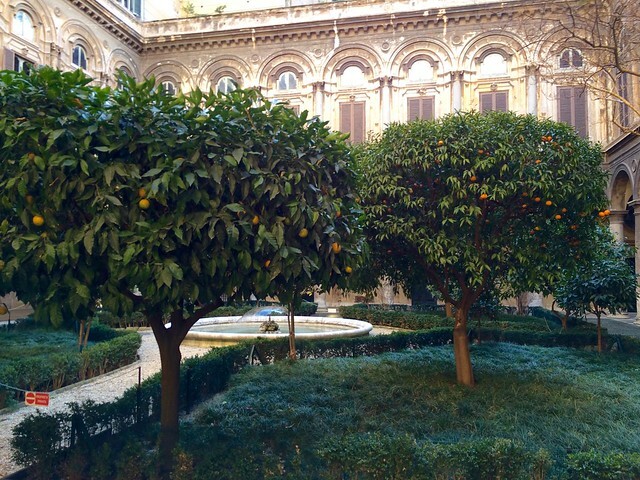 This vast palazzo along Via del Corso is still owned by the noble Doria Pamphilij family (subject of a Vanity Fair article in 2013, Palazzo Intrigue), and is one of the few and largest privately owned palaces in the city. The sumptuous palazzo, dating to the beginning of the 16th century, houses the Galleria Doria Pamphilij, a number of apartments and shops, and the private family residence. The Galleria Doria Pamphilij's immense collection of paintings, furniture, and statues has been assembled over 500 years by a succession of marriages and inheritances, and is now displayed in four Renaissance wings encircling the palazzo's inner courtyard. Included are works by Caravaggio, Titian, Raphael, Flemish Old Masters, and, most importantly, a portrait of Pope Innocent X by Velazquez. 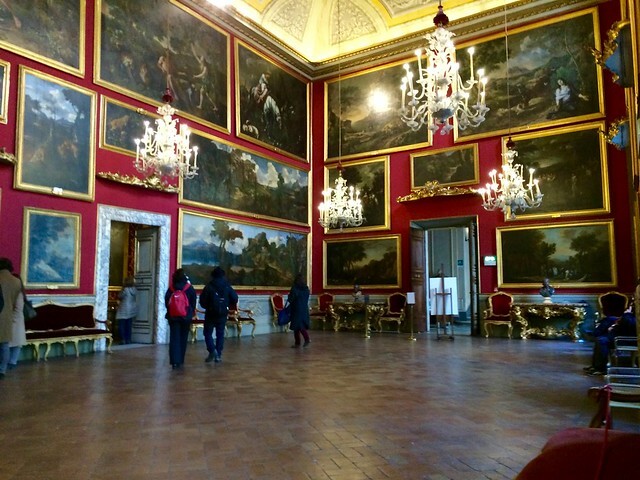 Like Palazzo Doria Pamphilij, the huge Palazzo Colonna is one of the rare privately-owned palaces in Rome and has been in the hands of the aristocratic Colonna family for 20 generations. 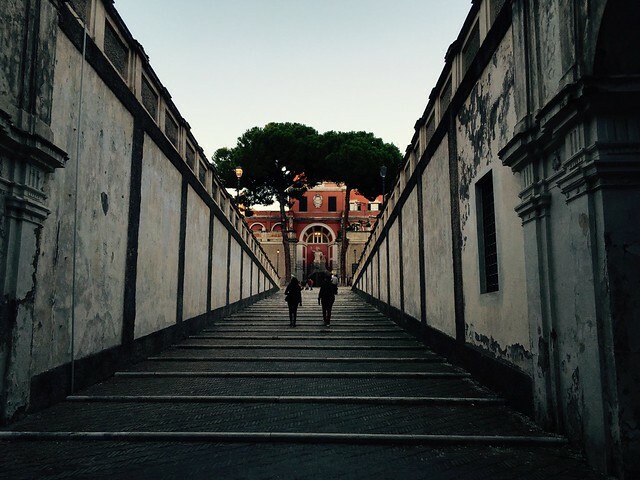 Located at the foot of the Quirinal Hill, the palazzo dates to the 14th century, though it was completed only in the 17th and 18th centuries, and is home to the Galleria Colonna, a masterpiece of Baroque architecture housing one of the largest private art collections in Rome. The lion's share of the collection was acquired after 1650 by members of the Colonna family and includes works by Domenico Ghirlandaio, Tintoretto, Guercino, and Guido Reni. The palazzo's galleries and halls are richly frescoed, including works by Pinturicchio in the Princess Isabelle's apartments, and the family opens the palazzo to the public once a week each Saturday morning.